What prompted this shift, of course, cannot be limited to a single cause. Feminism, poststructuralism, postmodernism, postcolonial studies and other “great advances in social theory and the human sciences…of late modernity” (2) have shed light on the limitations of previous studies characterised by the tendency to reinscribe traditional canons dictated by notions of the auteur and high art. Furthermore, recent changes in the geopolitical, socio-economic, demographic and cultural make-up of Europe (such as the processes of European integration, the dissolution of the Eastern Bloc, and the increased mobility of capital and people across national borders) have had a profound impact on European filmmaking and filmviewing practices. The recognition of these changes – which, in many ways, reproduce the processes of globalisation on a smaller, more local scale – has necessitated a radical reconsideration of the utility of national frameworks for the study of (especially European) cinema. In short, in the past 15 years film scholarship has witnessed a renewed interest in European cinema. However, since this reinvigoration of European cinema studies has been coupled with a gradual yet irrevocable delegitimation of its three main tenets (the auteur, high art and national cinema), film theorists have been compelled to look for new approaches and more appropriate frameworks, which can accommodate the transformations pertaining to cinema in the rapidly globalising, turbulent and increasingly hybrid world. The concepts of diaspora and exile have afforded productive models for displacing traditional frameworks, and transnationalism and cosmopolitanism are gaining momentum in the most recent theorisations of identity, community and culture, including cinema. The books reviewed in this article – Rosalind Galt’s The New European Cinema: Redrawing the Map and Ewa Mazierska and Laura Rascaroli’s Crossing New Europe: Postmodern Travel and the European Road Movie – are two of the latest additions to the growing body of conceptually ambitious and innovative work on European cinema. Both books claim, and deserve, a place at the forefront of contemporary European film scholarship; at the same time, however, they are also indicative of its current limitations. Paradoxically, it is what Galt’s and Mazierska and Rascaroli’s monographs do not do that is ultimately most revealing, and most valuable, in terms of identifying the direction in which the discipline of cinema studies, European and otherwise, should develop if it is to truly reinvent itself and keep abreast of the changes affecting the current production and circulation of filmic texts. In Crossing New Europe, Mazierska and Rascaroli – who have previously co-authored another book on European cinema, From Moscow to Madrid: European Cities, Postmodern Cinema (3) – argue that the road movie constitutes the emblematic genre of contemporary European cinema. The genre dramatises the changes in contemporary Europe and it embodies the transnational trends of European film industries. To anyone familiar with the current output of European filmmakers, such a statement must sound unremarkable. Yet a quick glance at the circulation of the road movie in theoretical discourses reveals that Mazierska and Rascaroli’s argument, however obvious it may sound, is in fact long overdue. Despite the overwhelming global popularity of the genre, among mainstream as well as independent and experimental filmmakers, the road movie is a relatively uncharted territory. The first and, for another decade and a half, the only book on the road movie appeared in 1982, when Mark Williams published The Road Movies (4). Since then, and until Steven Cohan and Ina Rae Hark’s collection of essays published in 1997, The Road Movie Book (5), only Timothy Corrigan attempted to define the genre in 1991 in his book A Cinema Without Walls (6). Two more monographs followed: Jack Sargeant and Stephanie Watson’s Lost Highways and David Laderman’s Driving Visions (7). In short, the literature on the road movie is scant, and Mazierska and Rascaroli’s Crossing New Europe is the first book-length study of the genre in a European context. As such, Crossing New Europe is an exciting novelty in the corpus of literature on European cinema for a number of reasons. Most obviously, the book challenges the commonly held assumption that the road movie is “a Hollywood genre that catches peculiarly American dreams, tensions and anxieties, even when imported by the motion picture industries of other nations” (8). Mazierska and Rascaroli trace the genre’s complex genealogy to its far more diverse literary and cinematic precursors. They list the usual suspects, ranging from The Odyssey, European medieval pilgrimage tales and Jack Kerouac’s Beat novel On the Road (1959) to American westerns, films noir such as Edgar G. Ulmer’s Detour (1946) and Joseph H. Lewis’ Gun Crazy (1949), and Italian neorealist films, whose “road movie-ness”, for Mazierska and Rascaroli, lies in their attention to landscape and preference for location shooting. However, more provocative, and compelling, is their claim that the birth of the road movie in fact coincides with the birth of cinema itself. According to the authors of Crossing New Europe, the first “travel films” ever made are L’Arrivée d’un train à La Ciotat (The Arrival of a Train at La Ciotat, Louis Lumière and Auguste Lumière, 1895) and Voyage dans la lune (Voyage to the Moon, Georges Méliès, 1902). Mazierska and Rascaroli thus refuse to read the appearance of road movies in contemporary European cinema as an instance of migration of an originally American genre to Europe. Instead, they locate the beginnings of the road movie genre proper in Europe. Yet theirs is not a parochial, Eurocentric intervention. Rather, Crossing New Europe maps the European resurgence of the road movie as the “return” of an inevitably transformed, long-time expatriate, whose iconography, tropes of migration, displacement and quest, episodic structure, ambiguous symbolism and, perhaps most importantly, cosmopolitan generic mobility make it a particularly apt vehicle for cultural critique and an exploration of the ongoing European story of integration and identity negotiation. In cinema studies, this translates into a peculiar map where America (that is, Hollywood) stands for “popular entertainment” and Europe is synonymous with “art cinema”, whereas “to put together ‘popular’ and ‘European’ rattles the security with which we use these terms” (11). Nearly a decade and a half later, Mazierska and Rascaroli respond to this issue in a nuanced and by no means simplistic manner. They do not deny the difficulty of bringing together the slippery yet overdetermined notions of the “European” and the “popular”. Yet their analysis of the appropriation of the road movie by the high priests of the European art house (such as Aki Kaurismäki and Werner Herzog) effectively thwarts the common trend to consider the phrase “popular European cinema” an oxymoron. And yet, there is something oddly old-fashioned about Section One of Crossing New Europe, titled “Authors on the Road”. While there seems to be a genuine desire to demonstrate the necessity of studying European cinema in the context of popular genres, Mazierska and Rascaroli “resurrect” some of the classic auteurs of the European silver screen: Kaurismäki, Herzog, Wim Wenders, Nanni Moretti, Eric Rohmer and Jean-Luc Godard, to mention but a few, populate the pages of more than half the book. A single chapter is dedicated to a less revered – and randomly chosen? – figure of European cinema: Patrick Keiller. Accordingly, the attempt to subvert the canonical status of all these filmmakers – by showing how “unexceptional” they are; that is, how symptomatic they are of the broader cultural and political climate in Europe – may well be lost on the reader baffled by Mazierska and Rascaroli’s overwhelmingly white, male and predominantly Western European pantheon of filmmakers discussed in Section One. It is only in Section Two, “Geographies”, that Mazierska and Rascaroli embark on a more genuinely postmodern journey through the European road movie. In their succinct discussion of films such as Agnès Varda’s Les Glaneurs et la Glaneuse (The Gleaners and I, 2000), Pawel Pawlikowski’s Last Resort (2000), Michael Winterbottom’s Butterfly Kiss (1995) and Lynne Ramsay’s Morvern Callar (2002), the authors tackle the topical issues of the post-Cold War proliferation of diasporic communities, the feminisation of migration, and the vexed relationship between travel, tourism, colonialism and Orientalism. If used as a textbook, this part of the book will prove rewarding to teachers and students of contemporary road movies and European cinema. The scope of theory covered in this section, especially in chapters five and six, is impressive, as are the lucidity, accessibility and cogency of Mazierska and Rascaroli’s overall interpretive application. The New European Cinema: Redrawing the Map approaches its (essentially identical) object of investigation quite differently. Rather than focusing on a particularly symptomatic genre, Galt argues that an exploration of the dialectics of space and memory is of vital importance to an informed analysis of any contemporary European filmic text. According to Galt, echoing the second section of Mazierska and Rascaroli’s book as well as the earlier Spaces in European Cinema (12), what is at stake in contemporary Europe – in cinema and otherwise – is cartography. Drawing on a range of recent theorisations of space (13), Galt argues that maps have the ability to delineate, (re)name and (re)organise social spaces and their history. She notes that this capacity of maps probably reached its climax with the age of colonialism and the formation of the nation-state. However, the post-war collapse of colonial empires and the current destabilisation of the nation-state have not diminished the relevance of space to the formation and negotiation of cultural and social identities. Quite the opposite: Galt argues that it is precisely these changes – particularly acute in post-Berlin Wall Europe – that have brought into focus the exigency of spatial representation; that is, the urgency of developing alternative, critical cartographies. In Galt’s opinion, cinema performs a key role in this push towards countercartographies. She sees cinematic space as “a key territory in which change could be imagined” (p. 89). Cinema is a powerful and popular cultural form which does not merely depict physical topography; rather, it allows the audience to reimagine the geopolitical and cultural maps of Europe. In agreement with Henri Lefebvre’s influential argument that space must be understood as socially produced (14), Galt argues that cinema’s spatial aesthetics can, and does, play a vital role in remapping social spaces and producing more complex topographies of belonging. Central to such a politicised understanding of cinema’s spatial aesthetics is the role of time and memory, which Galt never fails to acknowledge in her erudite analysis of a wide array of recent European films. Her argument is compelling and supported with a detailed historicisation of the chosen filmic texts and their subject matter. It is relatively easy to see the political value of such an analysis as regards films dealing with the collapse of boundaries and the redrawing of maps in an explicit manner: films such as Lars von Trier’s Zentropa (1991) or Lukas Moodysson’s Lilja 4-ever (2002). But, to my astonishment and delight, Galt’s ultimate forte is in fact her reinterpretation of what, at first sight, seem to be fairly apolitical films, namely, the much-maligned heritage films. Her recuperation and repoliticisation of nostalgic romantic melodramas Nuovo cinema Paradiso (Cinema Paradiso, Giuseppe Tornatore, 1989), Il Postino (The Postman, Michael Radford, 1994) and Mediterraneo (Gabriele Salvatores, 1991) is bullet-proof and nothing short of brilliant. These three films were made in the early nineties, during the most momentous steps in the process of European integration. Yet they do not seem particularly topical. The object of their desire – the object of their nostalgic gaze – is the beautiful landscape of the Mediterranean in the late forties. The films’ postcard aesthetics, which easily translated into domestic and international box office success, and their relegation of historical events to a distant, almost irrelevant background are so excessive that they led the majority of their commentators to dismiss them as reactionary costume dramas with no genuine engagement with history (15). Galt, however, manages to tease out quite different implications of their spatial and temporal aesthetics through a detailed account of the socio-political context to which the films refer diegetically, coupled with that of the time of their production. On the one hand, Galt shows that, in Italy in the early nineties, the South became the last remaining object onto which the disillusioned Left could project its nostalgic desire: the impossible desire for 1945, the moment of possibility that failed. On the other hand, equally important for a nuanced understanding of this sudden fondness for the South is the fact that, at least since the end of the Second World War, Italy’s internal division between the developed, affluent North and the “lazy”, “primitive” and “backward” South had been the site onto which Italy had projected its anxieties about its international identity, that is, about its position in the European Union. As Galt argues, with its reputation seriously tarnished and its economic situation deteriorating (thanks to the corruption and other criminal activities revealed by the nationwide police investigation called Mani pulite), Italian cinema in the early nineties had all the reasons to romanticise the South, for this is what Italy imagined itself destined to become within the European Union. Another strength of The New European Cinema is Galt’s decision to expand the scope of her investigation to include not only textual analysis but also, to some extent, the circulation of filmic texts. In doing so, her engagement with the issue of popular versus art cinema is more grounded and ultimately more compelling than that of Mazierska and Rascaroli. Crossing New Europe problematises this dichotomy exclusively through textual analysis framed in terms of genre criticism, whereas Galt complicates it further by documenting the production and distribution of the analysed films. This strengthens her refusal, shared with Mazierska and Rascaroli, to uphold the outdated model of discrete national cinemas. Crossing New Europe and The New European Cinema are formidable examples of current attempts to reinvent the field of not only European cinema studies but film scholarship as such. Both monographs go a long way towards transcending national frameworks; both assert a model of analysis with a strong historical dimension; and the conceptual interventions of both books by far exceed the object of their investigation. The two monographs, however, are indicative of the current state of (European) film scholarship in yet another way. Both texts articulate an explicit desire for a transnational understanding of cinema, yet they fail to recognise that such an understanding can only be fully developed through an interdisciplinary approach to the medium. While Crossing New Europe and The New European Cinema do make methodological imports from the fields of history, philosophy and social theory, neither recognises the urgency of incorporating empirical methods of anthropology, cultural studies and media and communication studies. Textual analysis and the analysis of industrial and historico-political contexts, perfected in Mazierska and Rascaroli’s and Galt’s publications, are certainly of vital importance to a comprehensive understanding of the role of cinema in contemporary society. However, to be able to make a credible claim that cinema occupies transnational, rather than merely international, public spheres, film scholars will need to recognise that such spheres come into being neither in screen representation nor in film production and distribution but rather among audiences. If the discipline of cinema studies is to truly reinvent itself, film scholars will need to let go of their long-standing love affair with the text, its author(s) and its abstract spectator, and embrace the empirical viewers, whose actual, lived practices of viewing and appropriating filmic texts constitute the site where transnational forms of citizenship and multi-sited modes of belonging are forged, cultivated and negotiated. 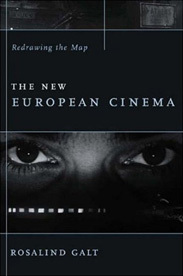 The New European Cinema: Redrawing the Map, by Rosalind Galt, Columbia University Press, New York, 2006. 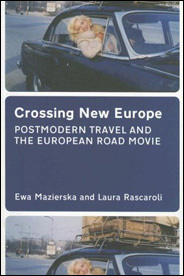 Crossing New Europe: Postmodern Travel and the European Road Movie, Ewa Mazierska and Laura Rascaroli, Wallflower Press, London, 2006. Ginette Vincendeau, “Issues in European cinema”, in John Hill and Pamela Gibson (eds), The Oxford Guide to Film Studies, Oxford University Press, New York, 1998, p. 440. Stuart Hall, “The Question of Cultural Identity”, in Stuart Hall et al. (eds), Modernity and Its Futures, Polity Press, Cambridge and Oxford, 1992, p. 285. Ewa Mazierska and Laura Rascaroli, From Moscow to Madrid: European Cities, Postmodern Cinema, I. B. Tauris and Co, London, 2003. Mark Williams, The Road Movies, Proteus Publishing Company, Saline, MI, 1982. Steven Cohan and Ina Rae Hark (eds), The Road Movie Book, Routledge, London and New York, 1997. Timothy Corrigan, A Cinema Without Walls: Movies and Culture after Vietnam, Rutgers University Press, New Brunswick, NJ, 1991. Jack Sargeant and Stephanie Watson, Lost Highways: An Illustrated History of Road Movies, Creation Books, London, 1999; David Laderman, Driving Visions: Exploring the Road Movie, University of Texas Press, Austin, 2002. Cohan and Hark, p. 2. Richard Dyer and Ginette Vincendeau (eds), Popular European Cinema, Routledge, London, 1992. Myrto Konstantarakos (ed. ), Spaces in European Cinema, Intellect, Exeter, 2000. Galt’s key sources include J.B. Harley, “Deconstructing the Map”, Cartographica, vol. 26, no. 2, 1989, pp. 1–20, and Irit Rogoff, Terra Informa: Geography’s Visual Culture, Routledge, London, 2000. Henri Lefebvre, The Production of Space, Blackwell, Oxford, 1991. Cf. Antoine de Baecque, “Le Cinéma d’Europe à la recherché d’une forme”, Cahiers du cinéma, nos 455–456, 1992, pp. 78–79.